تصفیه فاضلاب‌های حاوی هیدروکربن‌های نفتی به‌دلیل سمیت این نوع فاضلاب‌ها و تبعات خطرناکی که برای محیط‌زیست دارد ضروری است. یکی از سیستم‌های بیوفیلمی که در تصفیه فاضلاب‌های مختلف، مقاومت خوبی در برابر شوک‌های سمی و هیدرولیکی دارد، راکتور بیوفیلمی با بستر متحرک است. در تحقیق حاضر نقش سه مکانیسم عریان‌سازی، جذب توسط توده زیستی و تجزیه بیولوژیکی در راکتور بیوفیلمی با آکنه‌های پلی‌اتیلنی لانه‌زنبوری به‌منظور تصفیه فاضلاب پالایشگاه نفت تهران بررسی شد. براساس نتایج حاصل از این تحقیق، مقدار بهینه عوامل بارگذاری ((TPH 278 میلی‌گرم در لیتر با COD معادل 1000 میلی‌گرم در لیتر، زمان ماند 22 ساعت ‌و درصد پرشدگی آکنه 50 درصد به‌دست آمد. بررسی‌های آزمایشگاهی تأیید نمود که در حذف هیدروکربن‌های نفتی، هر سه مکانیسم عریان‌سازی، جذب و تجزیه بیولوژیکی بسته به غلظت هیدروکربن‌های نفتی به میزان مختلف تأثیرگذاراند. به‌طوری که مکانیسم غالب حذف، در بارگذاری‌های کمتر (TPH برابر 57 میلی‌گرم در لیتر با COD معادل 200 میلی‌گرم در لیتر) تجزیه بیولوژیکی و در بارگذاری‌های بالاتر (TPH برابر 278 میلی‌گرم در لیتر با COD معادل 1000 میلی‌گرم در لیتر)، عریان‌سازی بود. 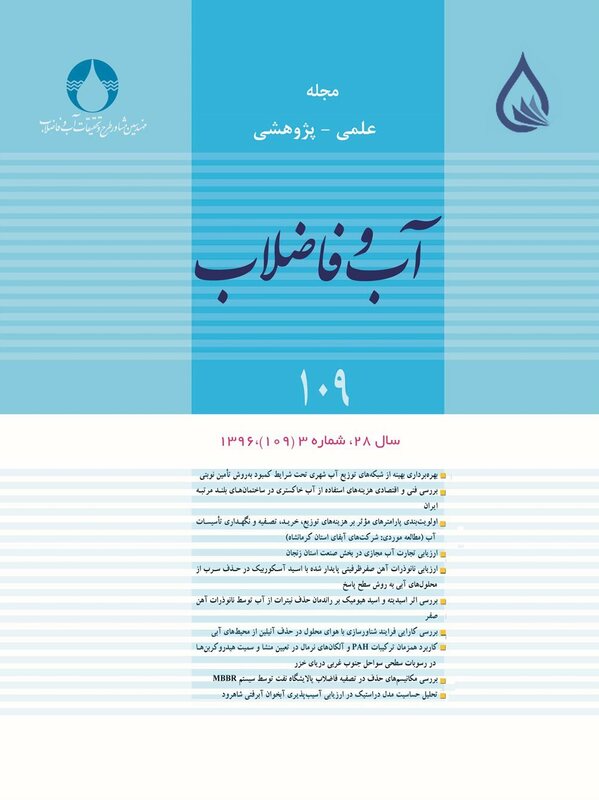 در شرایط بهینه میزان حذف هر یک از سه مکانیسم در TPH برابر 278 میلی‌گرم در لیتر (با COD معادل 1000 میلی‌گرم در لیتر) به‌ترتیب عریان‌سازی با 58 درصد، تجزیه بیولوژیکی با 29 درصد و جذب بیولوژیکی با 13 درصد به‌دست آمد. نتایج به‌دست آمده نشان می‌دهد، حذف هیدروکربن‌های نفتی از طریق مکانیسم عریان‌سازی و جذب بیولوژیکی حداکثر طی ساعت اول فرایند اتفاق می‌افتد. Effluents bearing petroleum hydrocarbons must be treated prior to release into the environment due to the high toxicity of these compounds and the consequent hazards they pose to the receiving environment. The moving bed biofilm reactor (MBBR) is one of the several biofilm systems used in treating different types of wastewater that offers a good resistance to both toxic and hydraulic shocks. This study investigates the roles of the three air stripping, adsorption, and biodegradation mechanisms in the biofilm reactor using polyethylene sponge strips used as the biomass to treat the effluent from Tehran Refinery. Results and discussion: Based on the results obtained, the optimum values of loading rate, retention time, and media filling ratio were equal to TPH=278 mg/L (COD=1000 mg/L), 22 hours, and 50 percent, respectively. Laboratory studies confirmed that each of the three mechanisms of air stripping, adsorption, and biodegradation may be involved in the removal of petroleum hydrocarbons by the MBBR system depending on hydrocarbon concentrations. More specifically, biological degradation was the dominant removal mechanism with lower loading rates (TPH=57 mg/l with a COD equal to 200 mg/l) while stripping became the dominant mechanism at higher loading rates (TPH=278 mg/l with a COD equal to 1,000 mg/l). It was found that under optimum conditions and at TPH=278 mg/L (and COD=1,000 mg/l), stripping removed 58%; biodegradation, 29%; and adsorption, 13% of the petroleum hydrocarbon content. It was observed that the removal of petroleum hydrocarbons by stripping and adsorption processes took place within the first process hour at the latest. Abdelwahab, O., Amin N.K. & El-Ashtoukhy E.-S.Z., 2009, "Electrochemical removal of phenol from oil refinery wastewater", Journal of Hazardous Material, 163, 711-716. Ayati, B., Ganjidoust, H. & Mir Fattah, M., 2007, "Degradation of aromatic compounds using moving bed biofilm reactors", IJEHSE, 4(2), 107-112. Ayguun, A., Yenisoy-Karakas, S. & Duman, I., 2003, "Production of granular activated carbon from fruit stones and nutshells and evaluation of their physical, chemical and adsorption properties", Microporous and Mesoporous Materials, 66, 189-195. Battelle., 2007, Sediment toxicity of petroleum hydrocarbon fractions, Report to Massachusetts Department of Environmental Protection , Office of Research and Standards, Boston. Bensadok, K., Belkacem, M. & Nezzal G., 2007, “Treatment of cutting oil/water emulsion by coupling coagulation and dissolved air flotation", Desalination, 206, 440-448. Bitton, G., 2005, Wastewater microbiology, 3rd Ed., John Wiley and Sons, Inc., Hoboken, New Jersey. Borghei, S.M. & Hosseini, S.H., 2004, "The treatment of phenolic wastewater using a moving bed biofilm reactor", Journal of Process Biochemistry, 39, 1177-1181. Calderón, K., Martín-Pascual, J., Poyatos, J.M., Rodelas, B., González-Martínez A. & González-López, J., 2012, Comparative analysis of the bacterial diversity in a lab-scale moving bed biofilm reactor (MBBR) applied to treat urban wastewater under different operational conditions", Bioresource Technology, 121, 119-126. Delnavaz, M., Ayati, B., Ganjidoust, H. & Sanjabi, S., 2012, "Kinetics study of photcatalytic process for treatment of phenolic wastewater by TiO2 nano powder immobilized on concrete surfaces", Toxicological and Environmental Chemistry, 94 (6), 1086-1098. Diyauddeen, B.H., Daud, W.M.A.W., & Abdul Aziz, A.R., 2011, Treatment technologies for petroleum refinery effluents: A review", Process Safety and Environmental Protection, 89, 95-105. Dong, Z., Lu, M., Huang, W. & Xu, X., 2011, "Treatment of oilfield wastewater in moving bed biofilm reactors using a novel suspended ceramic biocarrier", Journal of Hazardous Materials, 196, 123-130. Eckenfelder, W.W., 1926, Industrial water pollution control, 2nd Ed., McGraw-Hill, New York. El-Naas, M.H., Al-Zuhair, S. & Abu Alhaija, M., 2010a, "Reduction of COD in refinery wastewater through adsorption on date-pit activated carbon", Journal of Hazardous Materials, 173, 750-757. El-Naas, M.H., Al-Zuhair, S., Al-Lobaney A. & Makhlouf S., 2009, "Assessment of electrocoagulation for the treatment of petroleum refinery wastewater", J. Environ. Manage., 91, 180-185. Gargouri, B., Karray, F., Mhiri, N., Aloui, F. & Sayadi, S., 2011, "Application of a continuously stirred tank bioreactor (CSTR) for bioremediation of hydrocarbon-rich industrial wastewater effluents", Journal of Hazardous Materials, 189, 427-434. Greenberg, A.E., Clescerl, L.S. & Eaton A.D., 2000, Standard methods for the examination of water and wastewater, 20th Edition, American Public Health, Washington. Hasan, D.U.B., Abdul Aziz, A.R. & Daud, W.M.A.W., 2012, "Oxidative mineralization of petroleum refinery effluent using Fenton-like process", Chemical Engineering Research and Design, 90, 298-307. Ishak, S., Malakahmad, A. & Isa, M. H., 2012, "Refinery wastewater biological treatment: A short review", Journal of Scientific and Industrial Research, 71, 251-256. Jensen, L.K., Honkanen, J.O., Jager, I. & Carroll, J., 2012, "Bioaccumulation of phenanthrene and benzo[a]pyrene in Calanus finmarchicus", Ecotoxicology and Environmental Safety, 78, 225-231. Johnston, C.D. & Desvignes, A., 2003, "Evidence for biodegradation and volatilisation of dissolved petroleum hydrocarbons during in situ air sparging in large laboratory columns", Water, Air and Soil Pollution: Focus, 3(3), 25-33. Jou, C.J.G. & Huang G.C., 2003, "A pilot study for oil refinery wastewater treatment using a fixed-film bioreactor", Advances in Environmental Research, 7, 463-469. Lu, M., Zhang, Z., Yu, W. & Wei, Z., 2009, "Biological treatment of oilfield-produced water: A field pilot study", Int. Biodeter. Biodegr., 63, 316-321. Marcilly, C., 2003, "Present status and future trends in catalysis for refining and petrochemicals", J. Catal., 216, 47-62. Misiti, T., Tezel, U. & Pavlostathis, S.G., 2013, "Fate and effect of naphthenic acids on oil refinery activated sludge wastewater treatment systems", Water Research, 47, 449-460. Mizzouri, N.Sh. & Shaaban, M.G., 2013, "Individual and combined effects of organic, toxic, and hydraulic shocks on sequencing batch reactor in treating petroleum refinery wastewater", Journal of Hazardous Materials, 250-251, 333-344. Ødegaard, H., 2006, "Innovations in wastewater treatment: The moving bed biofilm process", Water Sci. Technol., 53, 17-33. Qaderi, F., Ayati, B. & Ganjidoust, H., 2011, "Role of moving bed biofilm reactor and sequencing batch reactor in biological degradation of formaldehyde wastewater", Iranian Journal of Environmental Health Science and Engineering, 8(4), 337-346. Rahimi, Y., Torabian, A., Mehrdadi, N., Habibi-Rezaie, M., Pezeshk, H. & Nabi-Bidhendi, G.R., 2011, "Optimizing aeration rates for minimizing membrane fouling and its effect on sludge characteristics in a moving bed membrane bioreactor", Journal of Hazardous Material, 186, 1097-1102. Salahi, A., Noshadi, I., Badrnezhad, R., Kanjilal, B. & Mohammadi, T., 2013, "Nano-porous membrane process for oily wastewater treatment: Optimization using response surface methodology", Journal of Environmental Chemical Engineering, 1(3), 218-225. Santo, C.E., Vilar, V.J.P., Botelho, C.M.S., Bhatnagar, A., Kumar, E. & Boaventura, R.A.R., 2012, "Optimization of coagulation-flocculation and flotation parameters for the treatment of a petroleum refinery effluent from a Portuguese plant", Chemical Engineering Journal, 183, 117-123. Stringfellow, W.T. & Alvarez-Cohen, L., 1999, "Evaluating the relationship between the sorption of PAHs to bacterial biomass and biodegradation", Water Research, 33(11), 2535-2544. Tyagi, R.D., Tran, F.T. & Chowdhury, A.K., 1992, "Performance of RBC coupled to a polyurethane foam to biodegrade petroleum refinery wastewater", Environ. Pollut., 76(1), 61-70. Xianling, L., Jianping, W., Qing, Y. & Xueming, Z., 2005, "The pilot study for oil refinery wastewater treatment using a gas–liquid–solid three-phase flow airlift loop bioreactor", Biochemical Engineering Journal, 27, 40-44. Yan, L., Bo Ma, H., Wang, Y. & Chen, Y., 2011, "Electrochemical treatment of petroleum refinery wastewater with three-dimensional multi-phase electrode", Desalination, 276, 397-402.